I am writing this as I am sitting in my parents’ kitchen while my sister Helena is making a flourless chocolate cake. I had volunteered to make dessert for our Sunday lunch but that was before I took a rather painful fall present shopping on Saturday afternoon. As it is, my battered ankle is propped up on a chair, the swelling hidden (and hopefully going down) under a bag of frozen peas. I am reading out the recipe for the flourless chocolate cake to Helena and we are both singing along to our favourite Christmas tunes. Although my yearly tradition of a brisk Christmas Eve run clearly won’t be happening this year, all in all life could be worse. Before I fully get into the holiday spirit and step away from this space for a bit there was one more recipe I wanted to share with you. Various rounds of recipe testing left us with quite the glut of mincemeat this year so while it keeps well I wasn’t keen on starting the new year with a fridge full of Christmassy mincemeat (there is after all a time and place for everything and as much as I love mincemeat, I know that come January I will crave simpler and brighter flavours than heavily spiced and sweet mincemeat). 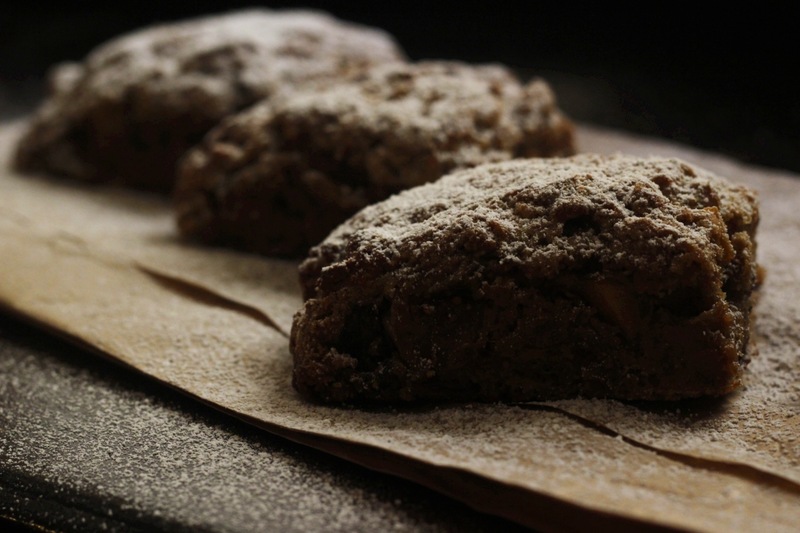 A rather easy and incredibly delicious way to use up mincemeat is to make mincemeat scones, so easy you could even make them for breakfast on the 25th should you be so inclined. They are wonderfully moist from all that fruit that has been steeping in brandy for several weeks and delicately spiced. 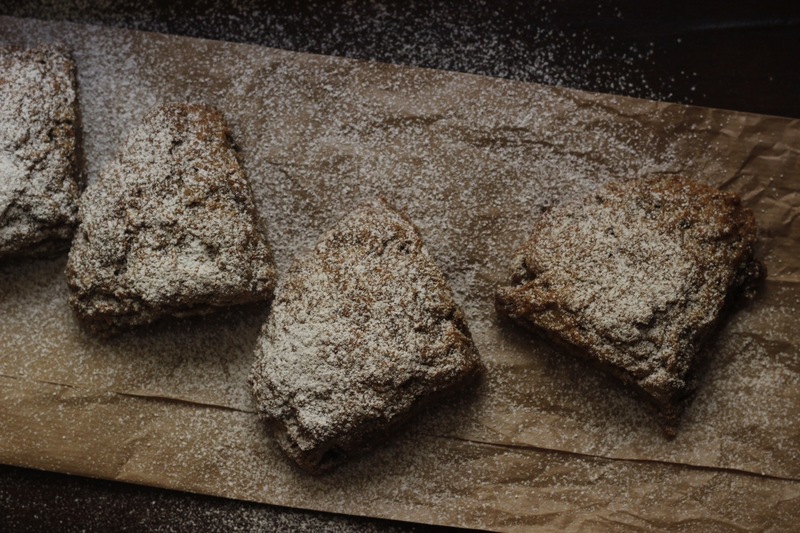 We enjoyed quite a few batches of these scones throughout December and I hope you will enjoy these as much as we did. I will be back here with a new post on the first of January. Until then, Merry Christmas and a Happy New Year! 1. Pre-heat the oven to 170 degrees Celsius and line a baking sheet with parchment paper. 2. In a big bowl whisk together the two types of flour with the baking soda and salt. Add the butter and rub into the flour until the mixture resembles sand with a few larger pieces of butter still visible. Stir in the brown sugar. 3. Add the mincemeat to the bowl and stir to distribute evenly. 4. Pour the yoghurt over the flour. Using your hands combine everything quickly into a ball – don’t worry if the dough is sticky and a bit rough, just make sure all the flour has been incorporated. 5. Dump the dough onto the parchment lined sheet and using floured hands shape dough into a rough circle, pressing down gently until the circle is ca 3-4 cm high. Using a floured knife cut the circle into 4 triangles, keeping the shape of the circle intact. Brush with the milk before placing in the oven for 20 minutes until risen and light brown in colour. Really nice, my scones tend to be a bit on the dry side, The mincemeat is brilliant, not only adding lots of flavor but moistness! Have a wonderful holiday!! Thanks Suzanne (and sorry for only responding now – I have only just gotten back to this space after a relaxing break at my parents). Hope you had a wonderful holiday and 2014 is off to a good start for you! As for the scones, they are definitely wonderfully moist, making me think that other canned fruit or fruit compotes might be a good addition (or even a savoury scone with a delicious chutney … ah, the possibilities! ).